For Cee’s challenge this week I thought I would snap some photos on my walk today. There aren’t too many flowers out right now, but I thought it would be fun to search for some. What I didn’t count on was the wind. Each time I got the camera in macro mode and was ready to snap, the wind kicked up. I was able to get two photos that weren’t completely blurry, but nothing spectacular. My other challenge today was Miles. He was in a mood. 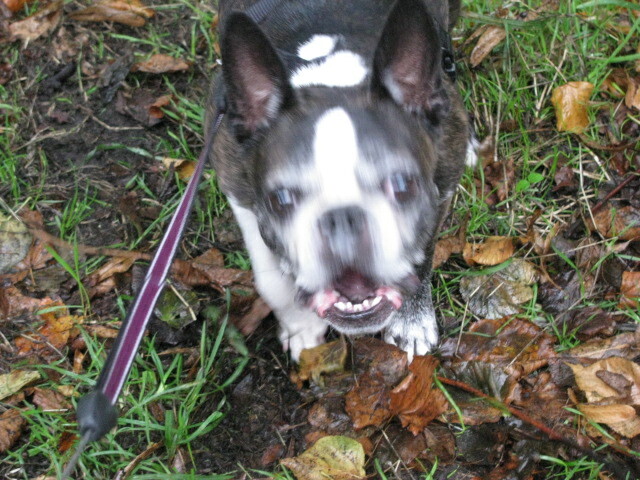 He wanted to chase all the leaves that the wind stirred up and not sit still for me to take photos. And when I told him to sit, he would bark his head off. Then I tried to take a photo of him barking, but he was so worked up, I couldn’t get a decent photo of him. Can you feel his anger? 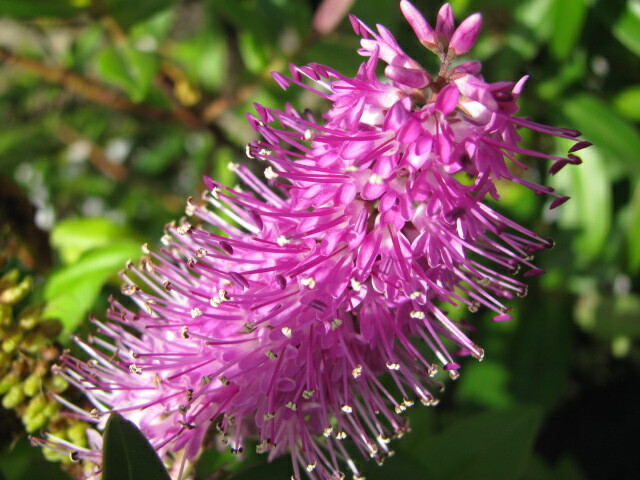 Here is a photo of a flower I took in London this past weekend. Wind and Miles were not an issue. This entry was posted in Photo Challenges and tagged 50 Year Project, England, Flowers, Flowers that Bloom Tomorrow, Japanese artists, Life, London, Nature, Photography, Photos, Wind, Yayoi Kusama. Bookmark the permalink. He wasn’t happy one bit. And to make it worse, I forgot to bring his red ball. Oh boy, that didn’t go over well. Trompie and Miles should go off together so we can take our photos. This post was so cute that it made me smile, although Miles does look a bit like a demon dog LOL. I love your flowers by the way, especially since ours are done for the year here :). How sad, you don’t have any left. I’ll do my best to share the color. 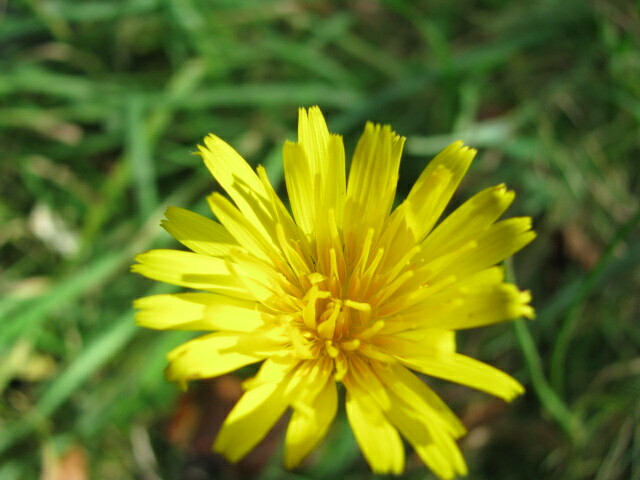 I love the flower photos! And Miles is adorable, even if he is barking! oh, let me check out your post. thanks! Lovely and I know your frustration with the wind! For your sake, I hope it’s the same one. 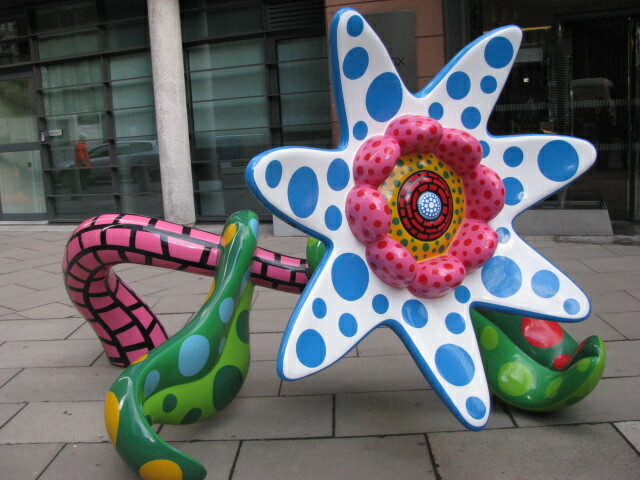 I did hear that this flower won’t be in London permanently. Oh I really hope your picture isn’t spoiled again. Her artwork has a sense of fun about it…cheerful, fun. it looks stunning. how big is it? taller than you? Love your flowers. I often have the same problem…just as I take out my camera and set it on macros, the wind starts blowing! I think Murphy lives in my shadow… That last shot is so interesting and different! What on earth is it made of? Clay, porcelain, steel? Good question, I don’t know. According to the web, fiberglass-reinforced plastic. I had no idea. The photo of Miles is hilarious! Rocky does funny things with his ears, but as soon as I get the camera out, he’s done. Oh I understand. Miles has this huge grin, but when I go for the camera, 90% of the time he gives me his serious pose. I hope you have some luck with Rocky. I would love to see the ear thing. Still trying. . . . I love the art flower!! How unique!! And of course I adore Miles and your other flower photos too. Thanks for playing along and having some fun!! It was fun! maybe not for Miles. He doesn’t like to listen. Thanks for hosting. I tried to take photos of MasterB playing in the wind today. Not very successful. Did you get to Yayoi Kusama’s exhibition at the Tate earlier this year? Alas, I did not see the exhibit. I wish I had, since I like this piece. Does MasterB chase the leaves like Miles? Sometimes. Today I had one of his toys with me that he had been playing with on the stairs. He actually plays with toys. Atticus will bat his toy once with his paw and then wander off, annoyed. Bright, colorful, fun. Miles did look like he had the best time walking ….thanks for sharing all these. very angry dog when he doesn’t get his way. Thanks…it’s a much easier subject to photograph. Maybe he’ll listen to you. Despite the wind and Miles you captured some beautiful shots. I love the flower sculpture! I love the whimsical feel of the sculpture…it makes me smile. I like the plastic flower. I don’t want to brag, but my greek stray dog is the perfect companion taking photos. I say “wait” and he stands waiting by my side ’til I’m done. Unfortunately that doesn’t work with my Jacky, to much energy, I guess. Lovely flower photos! You did well in the wind. Pretty flowers. Poor Miles, not a happy fella, was he?